You know how it is in the warmer months—you often need a light top when a cooling breeze comes along or you step indoors where there’s air conditioning. The Dancing Dolman Diamond Top looks great worn over a tank or cami, as well as by itself. Worked in pima cotton, the dolman shape that floats away from the body combines with the openwork stitch pattern to keep you cool yet covered. You’ll love having this pattern on your hook, because the medley of stitches is so interesting. The diamond pattern is crocheted from the bottom up. The fan edging hem is worked downward from the beginning chain edge of the diamond pattern. Then a simple crab stitch finishes off the neckline and sleeve edges. The tee is worked in two pieces and seamed. The bright blue color shown in the Dancing Dolman Diamond Top pattern evokes the seaside, adding to the chic and breezy look. But you can choose your most flattering color. This pattern would look shell-like and delicate in a soft pink and dramatic in fuchsia. The top goes everywhere and with everything, from a black skirt or slacks for work or with capris for a date or a day out shopping. 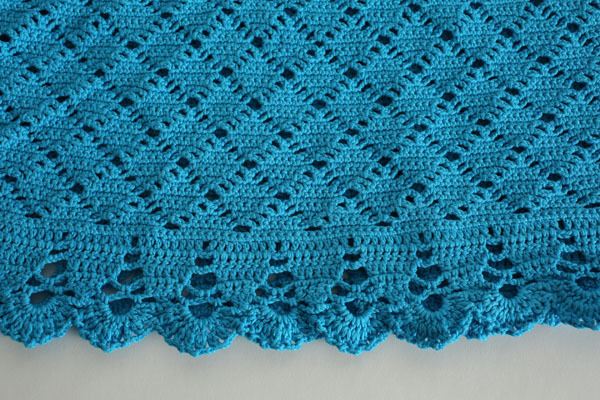 Amy Gunderson designed the Dancing Dolman Diamond Top pattern for I Like Crochet. Her patterns are favorites for their innovative designs and wearability. This comfortable yet polished crochet top will be a pleasure to wear from spring to early fall. Toss it on whenever you want to feel cool and look lovely. The Dancing Dolman Diamond Top pattern is included in the June 2016 issue of I Like Crochet. And, when you become a Gold Club Member, you can access this and all the other I Like Crochet patterns from anywhere. That’s right! At home or out and about, you can easily view this crochet top pattern on your laptop or tablet – it’s your choice! Of course, patterns are just the beginning of the goodies an I Like Crochet Gold Club membership provides. You also get stitch tips and tutorials, on top of the hundreds of patterns for crochet tops, accessories, shawls, scarves, and so much more. And the best part is, you can take all of it with you wherever you like to crochet – at home, in the park, on a plane or train … anywhere you choose! how do I print the instructions out? ?